This Phone Controlled Thermostat Kit remotely controls your thermostat using voice commands or touchtone keys. The Venstar Comfort Call Phone Controlled Thermostat Kit helps you to save money by controlling your thermostat over the phone! The Venstar Comfort Call allows you to call and 'talk' to your compatible thermostat using the latest in voice recognition and synthesis technology. This kit includes Venstar Phone Controlled Thermostat - T1700 and the Venstar Comfort Call Phone Thermostat Controller - AC4033. You will save energy by running your heater and air conditioning only when you're at home. The 1-Day Programmable Digital Thermostat allows you to program the heater to turn on half an hour before you normally arrive home or run the air conditioning only when necessary to keep the pets cool while you're at work. Monitoring and controlling your thermostat is now simple and easy from any phone, from anywhere. It can tell you the indoor temperature of your home and the outdoor temperature, provided there is a working outdoor sensor connected to the thermostat. Compatible with both heat/cool and heat pump systems, the 1-Day Programmable Digital Thermostat will control up to two heat stages as well as one cool stage. Note: Common wire required. If common wire not available see here for solution. Control range is 35 to 99 deg. F.
Approximate dimensions: 4.75" x 4.5"
Approximate dimensions: Comfort Call - 4.5" x 3.25"; Wireless Module- 2.875" x 1.5"
**Venstar Thermostat IR Control and Receiver (ACC0431) can be used with this thermostat to allow for local handheld control when Comfort Call is not in use. 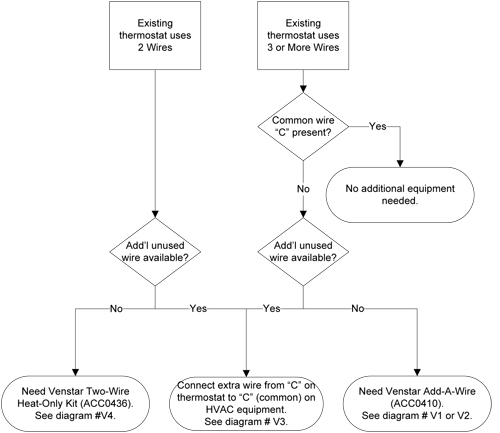 Venstar thermostats require a minimum of 3 wires for heat and a minimum of 5 wires for heat/cool (6 or more may be required if you have a heat pump system or staging). If you need assistance figuring out how many wires you'll need, email us at support@diycontrols.com, with a description of your HVAC system and a picture of your current thermostat wiring connections if possible. Please note that in rare cases, a manufacturer may use proprietary controls that may not be compatible with this thermostat. 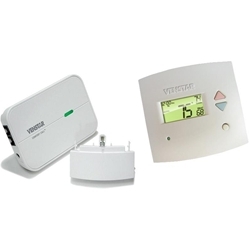 This kit includes Venstar Phone Controlled Thermostat - T1700 and the Venstar Confort Call Phone Thermostat Controller - AC4033.